Dorakie the house sprite shuddered as the young woman stood in front of the opening to her den in the fireplace stones. Surely this woman wasn’t going to take away Dorakie’s home? Bad enough that her First Ashes wouldn’t let her move to a new house with Harriet and Liz, her best people ever, but now she would lose her reason for staying here? “You did want to buy this place,” Jacob said. 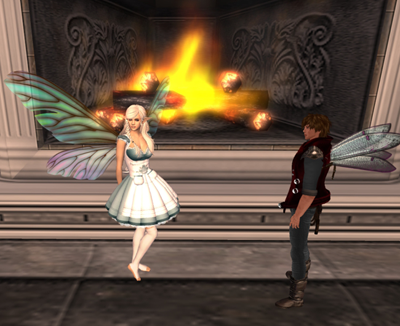 Dorakie shivered as Brittany’s heels clacked away from the fireplace. They’re getting rid of my hearth! She clutched at the little bag in her apron pocket. What was she going to do without her hearth? She’d be homeless! Sharp hot pinpricks tingled over her arms. Dorakie grabbed the hilt of her needle sword and crept close to the entrance of her den. “Not for long it’s yours,” the invading kobold grumbled. “First Ashes don’t count if the hearth is destroyed. I, Walther, claim this home for myself and my people. Time you were going, little house sprite! I’ll dig you out!” Clack! A rock hammer rattled against her entryway. “No!” Dorakie grabbed her the pouch of ashes in her apron pocket. “You can’t get rid of me that easily!” Where was the fireplace stone she kept loosely mortared for occasions like this? She whispered an invisibility spell complete with a benediction to She Who Tends and darted past Walther, scampering up the fireplace stones. Walther sniffed, suspicious, but kept staring at the crack leading to her den. Where is that rock? Dorakie pulled on the memory of its latest near-fall to help her locate it. Harriet had jumped, startled, when she knocked the rock loose while maneuvering a table past the fireplace. So it’s head-high. Dorakie had deflected the stone so that it landed next to Harriet’s foot without smacking the table. That was lucky, Harriet had said, lips pressed together thoughtfully as she stared at the fireplace. The next day she had set up a shrine near the hearth with tasty sweet snacks. The dollop of honey on a biscuit had charged Dorakie’s strength for days. The gods in the shrine had not objected when she helped herself, and she was always careful to share with them. There. The stone shifted under her hand. She tapped the rock with her finger. It slipped free and Dorakie hurled it at Walther. “Ouch!” Walther yelled, falling with a loud THUMP and a racket of breaking metal. He lay still and silent. Dorakie took a deep breath as she waited for him to move, tapping her fingertips three times against the fireplace in sequence, thumb, finger, finger. Still nothing. She’d have to check. Shivering with fear, she pulled the bag of ashes from her pocket and kissed it for strength. On a whim, she pinched about half the ash from her bag and sprinkled it over her head for more strength. Then she tucked it safely away, planning to creep past Walther and back into her den. “Got you!” Walther roared, seizing her. Dorakie bit his arm. He yelped and pulled free. She ducked away, dancing out of reach. Her stone had left a jagged tear across his bulbous face and his rock hammer lay shattered. Thank you, Harriet, for the memory of that blessed honey, she thought. Without it she would not have had the strength to break his hammer. But he was much taller and heavier than she, twice her height and easily three times her span. Even with the magic in her ashes this would be a difficult battle. “For my hearth!” Dorakie charged him, brandishing her needle sword. She danced in close to Walther and jabbed him, capering away before he could grab her. Perhaps she could lead him out across the threshold and raise the boundaries spell to lock him out. Walther was too quick. He seized her by the neck, one huge hand thrusting into her apron to grab for her ashes. “In the name of She Who Tends!” she shrieked, and thrust her needle deep into his gut. He bellowed and let go of her, chanting a healing spell. She stabbed at him again, forcing him back. She would make him go away, make him cross that threshold. Walther ducked under her sword. He grabbed her wrist and twisted her arm up behind her back. He planted one knee hard on her back while his stubby finger poked into her apron pockets. “Let. Her. Go,” someone commanded. Walther’s knee kept pressing on her back and his fingers fumbled over her ash pouch. Dorakie growled and squirmed. Then something yanked him off of her back. She rolled to her side. Where were her ashes? Frantically, she fumbled in her pocket. The ash bag warmed to her touch. Safe. But it felt smaller than it had before. She must have used more than she had thought to augment her strength. Assured her ashes were safe, she looked at her rescuer. Walther backed away from yet another sprite, this one between Walther and Dorakie in size. He wore a green tunic with brown breeches, his angular, knobby arms reminding Dorakie of the old, wizened apple tree outside the cottage. “But I have First Ashes,” Dorakie whimpered. “She Who Tends will think otherwise,” Dorakie answered. “They’re MY people!” Dorakie snapped. “They don’t live here anymore,” Walther interjected. “I won’t tell you,” Dorakie said, stiffening her chin. He pounced on her. Quicker than Walther with thinner and longer, more agile fingers, he extracted the pouch from her apron. Before she could cry out he ripped the pouch open and threw the ashes on her. “Ashes, ashes, show me the key to her people’s hearts,” the strange sprite chanted. “Strong enough to care for my people!” Dorakie blinked back angry tears. “Had your place,” Walther sneered. “And now their key is mine,” the strange sprite said. He gestured, and the sampler wiggled through the crack to fly into his hand. “Perhaps now I can go inside from my tree.” He tucked it under a flap of his brown jacket. “But what about me?” Dorakie whimpered. Already she felt diminished, shrinking in size in comparison to Walther and the strange sprite. “Go. Now.” Walther growled. A dog barked outside while two children screamed happily. All three sprites flinched. “But what about my things?” She couldn’t help sniveling as tears blurred her vision. “Wild wood sprites have no need of house things,” the strange sprite said. “We need to leave now, before the dog gets here.” The world flowed about them, and Dorakie found herself outside, bobbing behind the strange sprite as he clung to her hand. “I don’t want to be a tree sprite!” she cried out. But he was gone, and darkness was beginning to fall. She needed shelter, now, before the wild things of the night caught her. She hadn’t been inside so long as to forget about basic survival. Heartsick though she was, Dorakie wrapped the threads from the sampler into a tiny ball and tucked it into her apron’s pocket. Then she crawled into the tree’s core, scrambling up high inside the small rotten cavity just beginning to form inside the bigger branch of the fork. She found a couple of grubs and an ant to eat before she wrapped as much of herself as she could into her apron. The grubs and ant weren’t as tasty as that sweet morsel of honey and biscuit had been. Dorakie didn’t want to venture out of the tiny hollow the next morning. But the tree’s distress at the arrival of more ants put her to work fighting them off, then weaving a protective shield made of spider silk for the tree. To her surprise, the skills she had learned from evicting destroying intruders from the cottage also worked for the tree. In return, the tree freely gave her some sap. Between that and the bodies of the ants, Dorakie was able to eat enough to give her the strength to finish the needed tree repairs, cleaning the rot and purging the fungus that had threatened to overtake it. The tree gave her leaves and moss to create a bed. By mid-morning, she had made herself a small den in the tree’s hollow. Now what? She should forage for more food and make herself a warmer bed. But she was sore from yesterday’s battle with Walther and heartsick at the loss of her hearth. Dorakie decided to sit in the weak winter sun and think about what to do next. “R-row,” a familiar cat voice chirped at the foot of the tree. “R-r-row.” Dorakie looked. A gray tabby crouched below, great green eyes fixed on a sparrow perched on one of her tree’s branches. Smoky, one of Liz and Harriet’s cats. An indoor cat who didn’t know how to survive outside. But Smoky never escaped when Dorakie was there. She listened to Dorakie’s boundaries. The new sprite had failed them in this, and the boundaries spell was one of Dorakie’s strengths. Maybe this was her way back to her people. Dorakie wrapped the sampler threads around both hands. Unlike Liz and Harriet’s other cat, Ginger, Smoky could be influenced by a smart sprite. Dorakie had snitched rides around the house on Smoky before. With the sampler threads, she could guide Smoky back to the house and perhaps even inside before that other sprite found her. Then she’d have the right of return because she had done the household a favor. That other sprite would be bound by She Who Tends’s rules about favors and obligations. She just had to find a way to get onto Smoky. “R-rrow,” Smoky chirped again. She stretched her declawed paws up the tree to try to climb. “R-rrrrow,” she grumbled louder. Bit by small bit Dorakie crept down the tree. She didn’t want to spook Smoky. “Rrow?” Smoky’s frustrated chatter changed to curiosity. She ambled around the trunk. Dorakie leapt from the trunk to Smoky’s back. Smoky flinched and hissed, then ran away from the tree. Dorakie clung tight to Smoky’s collar, hoping that they didn’t attract a dog’s attention or anything worse. Home, she thought hard to the sampler threads. Bring me home. The thread tugged at her right hand. She pressed it against Smoky’s head to her. Smoky responded, just like she had in the house, slowing from a panicked run to a steady, ground-covering, jog as she remembered the cues Dorakie had taught her. They had trotted for what seemed to be ages, following the pull of the sampler threads, when a chorus of barks started up behind them. Dorakie urged Smoky into a run. She didn’t have to work hard to persuade the cat to go faster. Smoky bounded along faster than she would usually run, but the baying dogs—plural —drew closer. They approached a white picket fence surrounding a larger cottage with a lovely garden outside of it. Smoky flattened herself to slide under a Smoky-sized gap in the fence. Dorakie clung tight to keep from being scraped off. The sampler threads burned warm in her hand. They had reached Liz and Harriet’s new home. Smoky trotted around the back of the house purposefully. She shinnied through a small gap in a big cage of finely woven wire which held cat trees and a patch of grass as well as a cat box. Smoky ignored all that and slid through a pet door to go inside the house. A bright light flared. Then She Who Tends appeared, glaring at both of them. “Who summons me?” she growled. He Who Had Stolen Her Place flinched back from She Who Tends’s glower, but Dorakie faced She Who Tends without a tremor. “But I gave you a perfectly good tree!” He Who Had Stolen Her Place objected. “Let me speak to the tree,” She Who Tends said, cutting off He Who Had Stolen Her Place. “Nothing is to happen while I am gone. I thought I had things in order. Can’t afford to be losing any more sprites, woods or household.” She winked out of sight. He Who Had Stolen Her Place sat, visibly tired. Dorakie looked around. She sensed a leaky pipe under the sink, and wandered over there. “Pipes,” Dorakie said. “They leak.” She crawled through the gap between the cupboard doors under the sink to investigate. This was newer pipe than the previous house, but the joint was not completely sealed. She whispered a binding spell, forgetting that she did not have the right to mend things here. Then something grabbed her by her scruff, whisking her away from the plumbing and back into the kitchen. “What are you doing?” She Who Tends demanded, while He Who Had Stolen Her Place looked abashed. “Oh, I—I—the pipes were dripping under the sink, so I fixed them,” Dorakie said. “And I found other problems further on in the plumbing, so I…” Her voice trailed away as she saw the look on She Who Tends’s face, as well as He Who Had Stolen Her Place. “The plumbing listened to you?” She Who Tends asked. “Yes.” Smoky trotted past them with an intent look that Dorakie knew all too well. “Oh no you don’t,” she muttered, and whispered the boundaries spell to wrap around the outside cage. Smoky pushed through the flap and Dorakie followed her, watching as the cat headed for the hole, only to wander away from it looking confused. “Boundaries worked for you here,” She Who Tends said from behind Dorakie. “There is enough of your First Ashes in the things of your people that your spells work.” She frowned thoughtfully. “You have a gift for house tending. Not all sprites do. I have lost so many.” Sadness tinged her voice. “I will, She Who Tends. I swear by my first hollow and weave,” Flish said. “And Flish has an eye for organizing, based on what I saw in the garden,” Dorakie said. She Who Tends beamed. “I knew we could make this work!” She bent and kissed first Dorakie, then Flish, on their foreheads. “Live now in peace with one another.” She vanished. Dorakie and Flish looked at each other. Dorakie smiled as he disappeared, though she could hear him singing as he climbed into the attic. She looked around the kitchen. This house had a natural gas furnace and no fireplace. So where was she going to find herself a den? The stove hood and fan caught her attention. She clambered into the fan’s vent, slithering through the walls even though it tired her. A walled-off hollow space at the top of the cupboard was safely away from the fan’s ductwork, but private enough for Dorakie. She would have to make a gap to get into her new den without slithering through walls—but otherwise, it was a lovely, warm space. She heaved a big sigh and lay down on the boards. Soon enough her new den would be comfortable. But she was home. Flish pushed his way through the wall, tugging something through behind him. “I found these things. I know you house sprites like such trinkets! Here!” He pushed his double handfuls of fabric at Dorakie. She sorted through them. One of Liz’s hair ties. A holey sock from Harriet. And a small long-sleeved linen shift that didn’t smell of either Harriet or Liz. It was just the right size for Dorakie to wear. She took a deeper whiff of it. Doll clothing? Possible. “Thank you,” she said finally, holding the shift up. “Where did you find this? “No, no,” Dorakie said. “You must make yourself comfortable as well.” A strange warm feeling flowed through her as she spoke. Love was not a common emotion among sprites, not with the need to protect their individual territories and the shorter lives that reproduction gave sprites. Dorakie was too old now and too weak to consider it. But humans cared for each other without procreating—like Harriet and Liz—and perhaps she and Flish could develop similar feelings as well. “I will, soon,” Dorakie promised. After he left, she plumped up the sock to make herself a nice bed. Then she slid out of her den. Now to find an equally good present for Flish’s space. She looked forward to the opportunity to search out just the right thing for him. Joyce Reynolds-Ward is a speculative fiction writer who splits her time between Enterprise and Portland, Oregon. Her short stories include appearances in Well…It’s Your Cow, Children of a Different Sky, Allegory, River, and Fantasy Scroll Magazine, as well as on Curious Fictions (https://curiousfictions.com/authors/550-joyce-reynolds-ward). Her books include Shadow Harvest, Alien Savvy, Pledges of Honor (2018 Self Published Fantasy BlogOff Semifinalist), Challenges of Honor, and Klone’s Stronghold. Joyce has edited two anthologies, Pulling Up Stakes (2018), and Whimsical Beasts (2019). Besides writing, Joyce enjoys reading, quilting, horses, skiing, and outdoor activities, and is a member of Soroptimist International of Wallowa County. Joyce’s website is at www.joycereynoldsward.com. Her Amazon Central page is at https://www.amazon.com/Joyce-Reynolds-Ward/e/B00HIP821Y.